First off, allow me to apologize for the lack of activity here lately. I know I promised to start hitting you guys with more regular reviews, but June didn’t allow me a lot of time for writing of any kind because — and this is the part I make no apologizes for — I got married. It’s been a great month, but a busy one. The odd thing is, I did manage to squeeze in a healthy number of movies, while simultaneously having virtually no time to DO anything with them. Anyway, back to the usual stuff. In the interest of full disclosure (and to generate a little content here) I thought I’d present a regular tally of what movies I managed to see in the previous month. Some of them I’ve written about, most of them I haven’t. This list includes movies I saw for the first time, movies I’ve seen a thousand times, movies I saw in the theater, movies I watched at home, direct-to-DVD, made-for-TV and anything else that qualifies as a movie. I also choose my favorite of the month among those movies I saw for the first time, marked in red. Feel free to discuss or ask about any of them! Plot: In 1492, the warrior Vlad Dracula (Gary Oldman) returns from battle to find his wife Elisabeta (Winona Ryder) has killed herself after hearing a false report of his death. Enraged, Dracula renounces God and stabs a cross, which begins flowing with blood. He drinks the blood and screams. Over four hundred years later, solicitor Jonathan Harker (Keanu Reeves) is given an account from his colleague Renfield (Tom Waits), who has gone mad. Harker says goodbye to his fiancé, Mina (Winona Ryder again) and travels to meet his new client, Count Dracula of Transylvania – now a frail-looking old man, but with horrible power. When Dracula sees Harker’s photograph of Mina, he is stricken, believing her to be the reincarnation of his long-dead wife. Harker explores the castle, only to be found and fed upon by Dracula’s three “brides” (Monica Bellucci, Michela Bercu and Florina Kendrick). Concerned for Lucy’s ailing health, Seward calls for Dr. Abraham Van Helsing (Anthony Hopkins). He arrives to see Lucy again being drained of blood, this time by Dracula in shadow-form. He gives her a transfusion from Arthur. Elsewhere, Dracula plies Mina with absinthe, wooing her slowly. Harker manages to escape from Dracula’s brides and sends for Mina to join him so they can finally be married. When she bids farewell to her “prince,” he goes into a mad fit and kills Lucy. After her funeral, Van Helsing convinces her three suitors to join him in opening her crypt, only to find it empty. Lucy, now a vampire, enters the tomb with a small child intent on feeding, and the men slay her. Harker joins them and tells them Dracula resides at Carfax Abby, and they plan to destroy him. Van Helsing and the others go to the Abby and begin destroying the boxes of Transylvanian soil Dracula must sleep in. He, meanwhile, visits Mina, who begs him to grant her his gift of eternal life. As she drinks his blood, Van Helsing and the others burst in and force him back. He transforms into a horde of rats and escapes. He takes a ship to return home, but the others take Mina by train, a much faster voyage. Van Helsing and Mina travel to the castle, while the others try to head off the gypsies transporting Dracula’s casket. The Brides attack Van Helsing, but he manages to track them to their crypt and slay them by the light of day. The hunters catch up to Dracula at the castle. Morris dies in the battle, but not before stabbing Dracula in the heart. The wounded vampire crawls into the chapel where his curse began and dies, Mina by his side. She professes her love to him before cutting off his head, releasing him from his curse. A fresco appears, picturing the human Vlad and Elisabeta rising, at long last, into Heaven. Thoughts: You’ve got to give Francis Ford Coppola credit – the man doesn’t do half-measures. From the first moments of the film, when we see Gary Oldman marching around in blood-red armor sculpted to suggest bare muscle tissue, we know we’re in for a wild sort of ride. That’s only where it begins, though – Coppola took great pains to give this film a unique look, eschewing camera tricks, even the sort of green screen that was common when the film was made in 1992. Every effect is practical, including the projection of words on the faces of actors, the reflection of enormous eyes onto glass windows, and some frankly humorous model train work. Lightning strikes don’t look remotely realistic, instead giving the impression of someone shining a flashlight through a cut-out flat behind the actors. It’s as if Coppola decided that he was by god going to make sure everything he captured on film was no more complicated than he could have gotten out of a community theater production of the story. And boy, did he succeed. Despite the inherent goofiness of doing something this way, though, I find that the look of the film is one of the first things I loved about it. 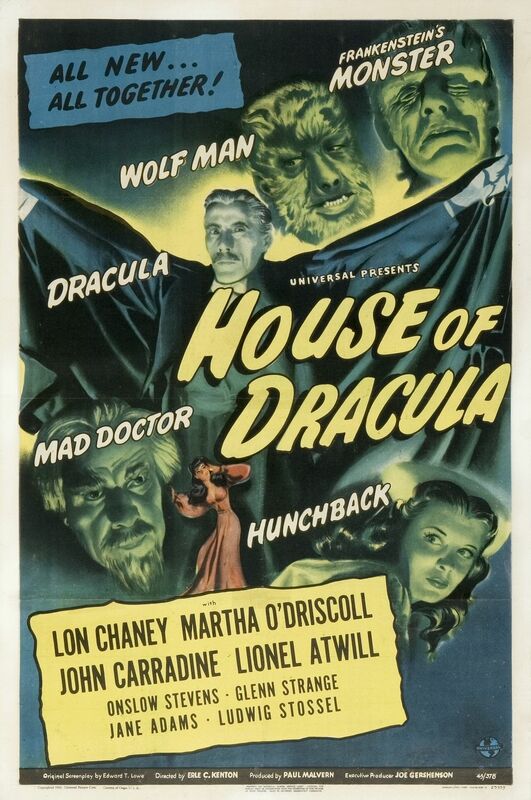 This doesn’t look like any of the other Dracula movies I’ve seen… hell, it doesn’t look like any other movie I’ve seen. It has a unique sort of style, not just in the design but in the way all the elements come together, that appeals to me in ways I can’t fully articulate. Let’s just say there’s something really cool about all of it, the same way you realize your dad was kind of cool when you get older and catch yourself making the same kind of jokes that embarrassed the hell out of you when he told them to your friends. On the plus side, some of the monster effects are really cool. While certain other films downplayed the notion that vampires could change their shape or were limited by the effects of the time, Coppola pulls off a pretty convincing monstrous transformation on the screen, with Oldman metamorphosing from a pale creature to a hairy, wolflike beast. (Yeah, folks, in classic lore vampires could turn into bats or wolves. Also mist. It’s cool.) The design of the human-sized bat is really creepy and worthy of the nastiest supernatural horror flick. The set design is impressive, and the costumes are top-notch. Gary Oldman… if ever there was an actor who gave himself entirely to the movie, it’s Gary Oldman. He’s given us the finest interpretation of Commissioner James Gordon ever to fit a Batman movie, and he’s also given us the insane, over-the-top lunacy of The Fifth Element. One thing you can count on is that he never phones in his performance. In this film, he revels in the cheesy dialogue and ridiculous character work he’s asked to do. Every chunk of scenery to be chewed, every wild arm flailing or preposterous accent… when Gary Oldman presents it to you, you know he believes it. Winona Ryder is pretty effective as Mina, pulling off a passable British accent and a convincing amount of young naiveté, as befits the character. Anthony Hopkins brings his usual air of class to Van Helsing, and Cary Elwes continues to prove, as I asserted back during Robin Hood week, that he should have been born in an earlier era, because he has the presence of a grand star of cinema’s Golden Age. Keanu Reeves plays Keanu Reeves. I’m a little weirded out by the ending, to be perfectly honest. 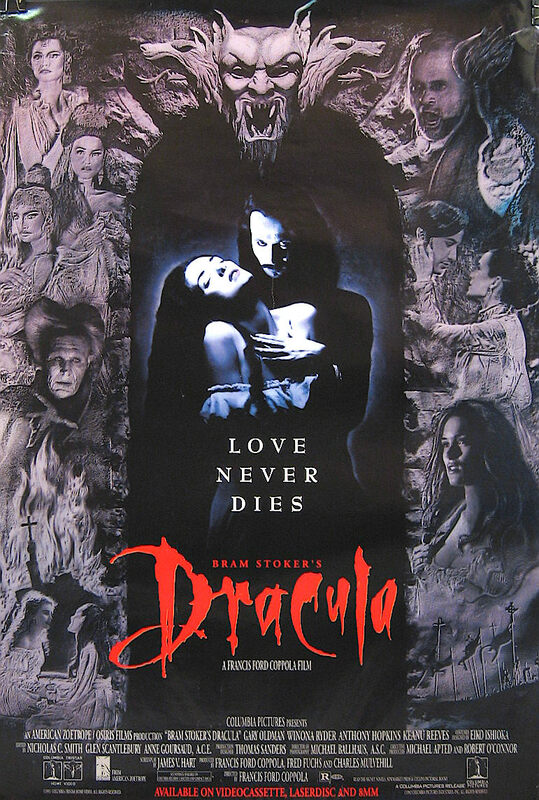 Coppola appears to be trying for some sort of fable about the healing power of love, showing some sort of redemption for Dracula after Mina’s love “sets him free” (by means of brutal decapitation). That’s all well and good, lord knows there aren’t many people that believe in true love as much as I do, but is Dracula really the best place to insert that particular moral? The man is, by every definition of the term, a terrible monster. He chose to turn against God, he brutally murdered countless people over 400 years, but at the end he seems to get a pass just because he got a woman (that he gave the vmpire equivalent of a roofie) to say she loves him. That’s the ending of Beauty and the Beast, except that the Beast was only guilty of kidnapping and a little mild verbal abuse. How does Dracula deserve redemption? That aside, I enjoy this movie quite a bit. It’s a well-made production with its own look and feel that sets it apart from any other version of the character, and for me, that’s one of the most important things you can look for in a movie. Plot: In the 18th century African Prince Mamuwalde (William Marshall) seeks out the aid of the regal Count Dracula (Charles Macaulay) in helping him snuff out the slave trade. Dracula refuses, attacking Mamuwalde and cursing him to share in his vampirism before christening him “Blacula” and sealing him in a tomb. Over 200 years later, long after Dracula’s death at the hands of Van Helsing, his property is purchased by a pair of interior decorators (Ted Harris and Rick Metzler) who find Mamuwalde’s coffin and bring it to Los Angeles. There, as they examine their purchases, the vampire awakens and slays them both. At the funeral for one of the victims, Dr. Gordon Thomas (Thalmus Rasulal) examines the body to find it surprisingly empty of blood, despite his mother’s request he not be embalmed. Mamuwalde encounters Tina Williams (Vonetta McGee), whom he takes to be the reincarnation of his wife, Luva, and attempts to pursue her, but loses her when he’s struck by a taxi cab. The driver (Ketty Lester) makes for a good snack. Gordon is summoned to examine the driver’s body and finds her injuries, like the decorator’s, to be consistent with the legend of the vampire. Mamuwalde continues to stalk and slaughter the friends of his victims, while Dr. Thomas begins a search for the serial killer. 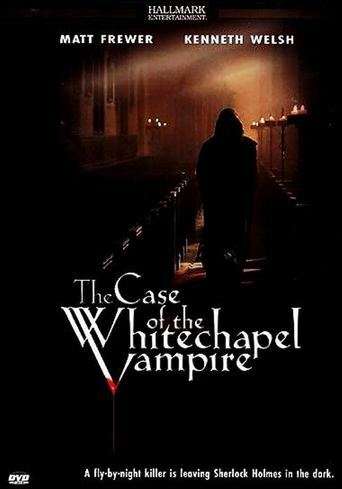 When he opens the grave of one of the victims, he finds the man has transformed into a vampire. After a brief struggle, Gordon stakes him through the heart. Mamuwalde, meanwhile, has found and romanced Tina, who becomes engrossed in his promise of eternal life if he makes her a vampire as well. Gordon shows Lt. Jack Peters (Gordon Pinsent) the transformed cab driver as she attacks, but is destroyed by sunlight. 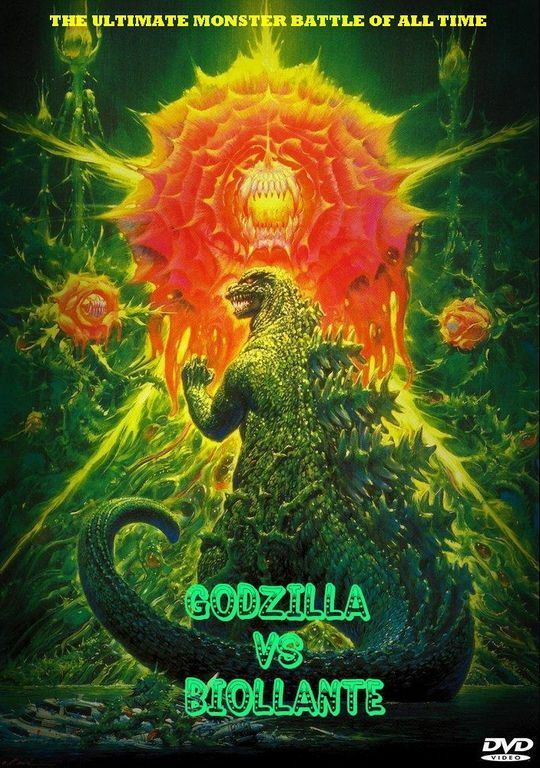 Together, Gordon and Peters begin to hunt the monster, not realizing Tina is now dating the beast until Gordon develops a picture he took only to find Mamuwalde doesn’t have an photographic image. The cops swarm the city, seeking not only Mamuwalde, but his assorted victims, each of whom is rising and transforming. They track him to a warehouse, where an entire horde of vampires attacks and slays a police officer. They barely escape with their lives and the police issue a city-wide curfew in the hopes of depriving the vampires of potential victims. Tina, however, slips out and seeks Mamuwalde, who transforms her into a vampire. Peters kills her, devastating Mamuwalde. His reason for living gone, the vampire steps outside and allows the sunlight to reduce him to ash. Thoughts: Perhaps I’m cheating a bit with this film. After all, Dracula himself is a supporting player at best – but in dealing with the pedigree of this character and the various interpretations he’s enjoyed over the decades, it’s hard to ignore William Marshall’s turn in the cape and fangs. This is the first time I’ve delved into the Blaxplotation subgenre here in Reel to Reel and with good reason – a lot of those movies are terribly goofy and many of the others are instantly forgettable. 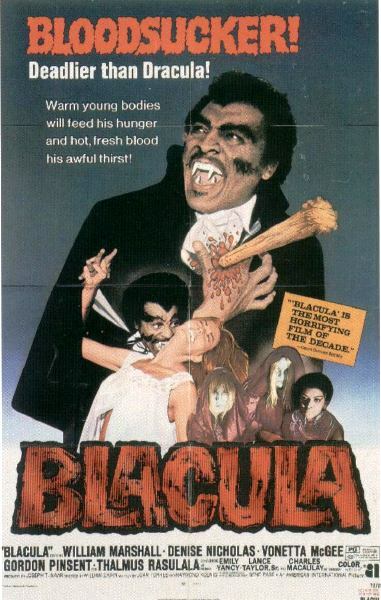 Something about Blacula, however, has withstood the test of time, even if it’s mainly as a curious footnote in the horror genre. Speaking of cultural dissonance, this is one of the few times since I’ve started these reviews that I’ve actually caught myself irritated at an older film that doesn’t accept the tropes of a more recent one. As Gordon and Peters are attacked by the vampires in the warehouse and their redshirt cop buddy starts pumping useless bullets at the bloodsuckers, I found myself asking why they didn’t just start staking them in the heart. It wasn’t until a minute or so later that I remembered the likes of Buffy the Vampire Slayer, From Dusk ‘Till Dawn and the Blade trilogy were still two decades away from making a staking seem like a walk in the park. Back in the 70s, it still took effort to kill a vampire. The rest of the movie works better than the title character. When each of Mamuwalde’s victims transforms into a vampire they provide a brief but legitimate scare. The cab driver in particular is rather effective, leaping at the camera even as she goes after Pinsent. Her makeup is far more convincing, her performance far more menacing in the few seconds before she’s destroyed by the sunlight. The vampire horde is actually really creepy, feeling slightly zombie-ish, but scarier in that these are creature that still possess intelligence. Unlike zombies, vampires retain their mortal selves in many ways, making the evil that lurks beneath even more pronounced. Thalamus Rasulal makes for an effective Van Helsing substitute in this modern retelling, accepting the reality of his situation relatively quickly and teaching himself what to do to combat the threat of the vampire. He’s our de facto hero, and helps propel the story where you want it to go. His performance actually helps spur one of the few real innovations in this film – once provided with some solid evidence, the police join in the search rather than turning into stonewall skeptics the way the usually do in genre movies. Not only does Peters easily buy into the notion that there’s a vampire stalking his city, but he manages to get the entire force in on the action. I can’t think of a single horror movie before or since where such a thing happened unless the situation reached the level of a full-on apocalypse. The final scene of the movie, as Mamuwalde melts in the sunlight, would make a remarkably effective visual stunt if not for the fact that the makeup and worms are applied to a dummy that doesn’t quite seem to fit the proportions of the actor. In a way, that’s not a bad metaphor for this movie as a whole – it has all of the traits you want in a good vampire movie, but doesn’t entirely succeed at convincing you you’re watching an honest effort to scare anybody. I’ve seen worse movies – I’ve even seen worse Dracula movies – but this movie somehow just feels more like a cultural oddity than anything that will leave a lasting impression on me. Plot: Librarian Jonathan Harker (John Van Eyssen) is called to Castle Dracula by its mysterious count (Christopher Lee). 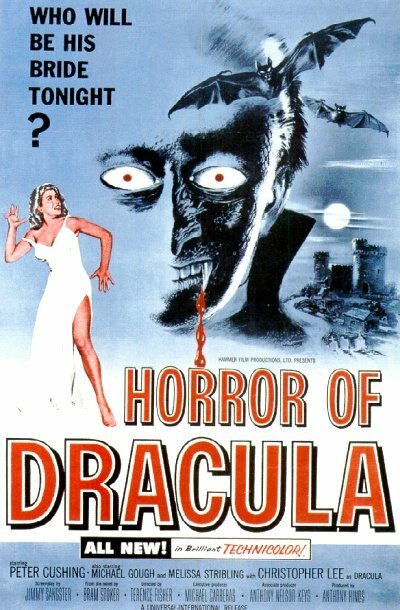 He encounters a strange woman (Valerie Gaunt) who begs him to help her escape, but she flees as Dracula makes his appearance. Dracula has summoned Harker to index his enormous collection of books, and encourages him to make the castle his home as he works. As Dracula leaves him, Harker pens a journal entry that reveals his true intention – to end the Count’s reign of terror forever. That night, he again encounters the strange woman from before, and she again begs his help, only to bite him on the neck. As she does so Dracula appears, blood on his mouth, and he attacks the woman. Harker grapples with the Count, but is defeated, and Dracula takes the woman away. Harker wakes up in his bedroom the next morning, a pair of fang-marks on his neck, and decides he must exterminate Dracula before sundown. He finds the crypt and drives a stake through the vampire woman’s heart, awakening Dracula just as the sun goes down. Dracula seals Harker in the tomb. Some time later Dr. Van Helsing (Peter Cushing) stops at a tavern, seeking word of the missing Harker. A tavern girl gives the Doctor a book she found – Harker’s journal. He finds Castle Dracula and the bodies of both the vampire woman and Harker. Van Helsing returns to Harker’s bedridden fiancé, Lucy (Carol Marsh) to tell her of Harker’s death, but her brother Arthur (Michael Gough) and his wife Mina (Melissa Stribling) hide the truth from Lucy, unaware that she is already being visited by Dracula in the night. He is biting her, draining her slowly, preparing her to become his new thrall. As Lucy is treated for what her doctors believe to be anemia, Van Helsing recognizes the symptoms of a vampire attack. He orders the windows in her room shut at night and the room filled with garlic cloves. At Lucy’s behest, though, her housekeeper (Olga Dickie) opens the windows and removes the garlic. In the morning, Lucy is found dead. Later, the housekeeper’s daughter Tania (Janina Faye) claims to have encountered her dead “Aunt Lucy.” Arthur goes to her tomb that night and finds it empty. Lucy, now a vampire, summons the child to her and they encounter Arthur. Van Helsing saves him and stakes Lucy, sending her to a true rest. Arthur gives Mina a cross to wear, but upon touching it she shouts and collapses, the cross burned into her flesh. She, too, has been touched by the vampire. That night, Dracula comes for Mina again, draining her so completely Van Helsing has to give her a transfusion of blood from Arthur. 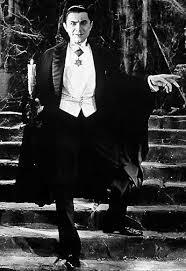 Van Helsing finds Dracula’s coffin in the cellar, but the Count takes the moment of distraction to take Mina and flee. They chase him back to Castle Dracula, where Van Helsing exposes him to the light of the sun. Dracula shrivels and turns to dust, his reign of terror ending… until the sequel. Thoughts: It is utterly unforgivable that I’ve been conducting these movie studies for three consecutive Octobers now, and this is the first time I’ve touched upon the storied Hammer Films catalogue of horror. While Hammer may not have the immediately recognizable icons of Universal (although they in no small way owe their fame to remaking the characters Universal made famous), it’s no less an important chapter in the universe of terror, and I should have delved into it a long time ago. That said, I picked a great film to begin my Hammer Horror education. Horror of Dracula was Christopher Lee’s first time portraying Count Dracula, and he did a fantastic job in the role. Although largely absent from the middle section of the movie, his presence is compelling and powerful, a real menacing figure worthy of the Dracula name. In the final confrontation with Van Helsing, he momentarily devolves into a mad, snarling beast, and it’s a great moment. You’re terrified of him, you think he’ll rip Peter Cushing’s throat right out. He’s a monster in the best sense of the word. He’s also the subject of some pretty impressive special effects. When the sunlight kills him at the end, the way he wilts away into nothing is really remarkable for a 1958 film. Hammer truly was on the top of its game. As Van Helsing, Peter Cushing makes for a great hero. There’s an authoritative sense to him – he’s a man you want to trust in the middle of a terrible ordeal. He carries a gravity and a power that makes the situation seem just as serious as a horror film should seem. 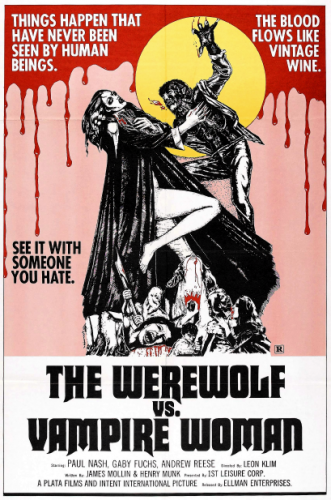 Even now, over 50 years later, this really works as a horror classic. The structure of this film is odd. It’s based on the original Dracula novel, at least in part, but both the plot and the characters presume a great deal of familiarity with the Dracula concept even before the film begins. Harker knows who and what Dracula is and has a plan to destroy him from the very outset, although Dracula seems at least initially fooled by his façade of being a simple librarian. It’s almost as if the film’s heroes had read the novel and decided they wanted to cut off the monster at the pass. Of course, that sort of genre awareness seems to evaporate when Harker reaches Dracula’s crypt and stakes the woman first. Seriously, man? You always kill the boss first, if you’ve got the chance. It’s like this 19th century character from a 1950s movie had never played a video game or something. Although clearly inspired by Bram Stoker, screenwriter Jimmy Sangster took some unusual and rather inexplicable liberties – changing Harker’s love interest from Mina to Lucy, making the two sisters-in-law, making Arthur Mina’s husband and so on. All in all, the film succeeds in telling a perfectly coherent story, but it’s not exactly the same story as the book. That’s not necessarily a bad thing, mind you, but it is a… thing. That happened. And I find it curious enough to point it out. The film also attempts to distance itself from the novel, accepting the by-then common conceit that the vampire cannot venture out in the daylight (absent from the novel) and dismissing the idea of the vampire changing its shape as “pure fallacy” (this idea was present in the Stoker original). I’m truly not sure what to make of it. The writer really seems to be struggling to buy in to the existing Dracula mythology, while picking and choosing the parts he likes and bringing in other elements pretty much at will. I don’t know how a storyteller reconciles those two impulses, but Sangster at least manages to turn out an entertaining story in the mix. If nothing else, the movie is plenty of fun and a great film to throw on during your Halloween party… or any other time you’re looking to have a creepy good time. Next Week is DRACULA WEEK! Don’t worry, friends, I’m not forgetting THE most legendary incarnation of the big bloodsucker. But longtime readers know that I’ve already given Bela Lugosi the Reel to Reel treatment in the very first project two years ago. (Then again for his appearance in Abbott and Costello Meet Frankenstein, which means I’ve officially written about every film in which Legosi played Dracula.) So rather than writing about him all over again, I’m going to direct you guys back to that original article, then hit you with five different versions next week. Fair? Okay, now that that’s settled, let’s think about just who Dracula really is, shall we? In the shadowed land of Transylvania, the ancient Castle Dracula stands as a monument to its lord, a creature of Evil. Legend has it he rises at night and drinks the blood of the innocent to maintain his own eternal unlife. But more than perhaps any other character in Icons, Dracula has many, many incarnations — everything from a dark elder god to a charming philanderer to a child’s mascot of creepy fun to an unlikely antihero. Next week, we’re going to think about five such Draculas. Come back on Monday, friends! Plot: The week after a strange murder in an abbey, Sherlock Holmes (Matt Frewer) and Dr. Watson (Kenneth Welsh) are engaged in a debate on the existence of an afterlife. Holmes is sent a message from the Whitechapel Abbey informing him that there are fears that the murder was the work of a vampire, something Holmes dismisses as unscientific nonsense. At the Abbey, Brother Marstoke (Shawn Lawrence) gives them a tour, telling them of a legend of a demon that manifests itself as a vampire bat. Following a failed attempt to exterminate a colony of bats, a series of murders have brothers of the abbey. There have even been mild tremors from time to time, something Holmes experiences himself. The first murder came with a message written in blood that convinces the Brother that a vampire is responsible, but Holmes recognizes a different modus operandi – that of the still-at-large serial killer Jack the Ripper. Although Holmes continues to play the skeptic, Watson is at least open to the possibility of a supernatural explanation behind their latest case. Holmes questions Dr. Chagas (Neville Edwards), a scientist who was studying the bats before Marstoke had many of them killed, and who has a bitter anger against the monk. While Holmes returns from his visit with Chagas, the killer strikes again, murdering a monk and attacking a nun, but he seems to be frightened off by the light glinting from her crucifix. Holmes speaks to Inspector Attley Jones (Michel Perron), who has arrested Chagas, but as Holmes was with him only minutes before the last murder happened, he is no longer convinced of Chagas’s guilt, even though his gloves are covered with blood. As Holmes and Jones argue, Chagas escapes. Holmes finds that others in the Abbey have a grudge against Marstoke, including Brother Abel (Tom Rack), who sees Marstoke’s fascination with vampires and demonology to be sacrilegious. Holmes is attacked by a robed figure who tries to shove him in front of a speeding horse. Holmes escapes, but so does his attacker. Watson calls the people of the Abbey together with a message from Holmes: he has been arrested, and he now believes that there is a demonic influence upon the Abbey. Brother Marstoke, blaming himself for bringing evil to the church, swears to leave in the morning. As he goes, alone, to pray that evening, he is approached by the robed killer. The killer is surprised to find Holmes instead, and the two grapple for Holmes’s gun. Although the killer gets the upper hand, the police arrive just as another tremor hits. A statue topples over and crushes the killer. Holmes unmasks the body to reveal Brother Abel. Watson later explains that the tremors were actually because the Abbey’s foundation has been weakened by nearby expansion of the London underground to Whitechapel. Holmes explains that when Jones found the blood on Chagas’s gloves was actually bat blood and not human, he realized he was innocent and the three men set the trap for Abel. Holmes then reveals the several small clues from throughout the film that pointed to Abel, and Chagas provides the motivation – Abel had been stricken by a disease he blamed Marstoke for bringing to the chapel. The case closed, Watson asks his friend if Holmes has reconsidered his stance on the supernatural, considering the tremor’s remarkably timely rescue. Holmes, of course, will have none of that. Thoughts: You know you’re in for a treat when the very beginning of a movie is a title card proclaiming “The film is based on the stories of Sir Arthur Conan Doyle, which is in the public domain, but it has not been authorized by any owner of any rights in the works of the author.” Even though it should say “which are in the public domain,” it still gives you this warm, fuzzy feeling of confidence, which is matched only a second later when the next card reminds you that you’re watching a Hallmark Presentation. Ah, Sherlock, what are you in for this time? Let’s be clear here – we are past the time when “made for TV” or “direct to DVD” was automatic code for “cheap and poorly-made”. Some television networks have made excellent motion pictures, some really good films are made specifically for retail-only release, and the evolution of digital media will probably lead to even more quality entertainment produced in such a fashion. This film, however, was made in 2002, when “made for TV” still had a cheap feeling to it. The sets and costuming are all perfectly good, but there’s a weak musical score that sounds like it was whipped up on a synthesizer bought from Best Buy and the cinematography has that sort of… well, for lack of a better term, “TV” feel to it. You probably know what I mean – it’s an undefinable quality that allows you, at a glance, to tell if the film you’re watching was shot on a budget or not. None of that is what really makes this film weak, though. The biggest problem is the pace. The story feels like it wants to be a TV show rather than a movie… it’s slow, it unreels at a tempo that’s a bit frustrating. The writer seems to be under the impression that it’s okay to leave things dangling because he can always pick them up next week, then has to rush in the last five minutes when he realizes that isn’t possible. Even though this was the fourth (and final) Hallmark Holmes movie starring Frewer, you’d want a film of this nature to feel like it can stand on its own, which it never really does. The movie is only 88 minutes long, but may be the longest 88-minute movie I’ve ever seen. Generally speaking, I like Matt Frewer as an actor. He may be best known as a Max Headroom (if you’re a child of the 80s – if you were born later you likely don’t know him at all), but he’s done good turns in things like The Stand and, more recently, a moving performance as a cancer patient in 50/50. However, he’s really ill-suited to Holmes. Frewer is surrounded by a cast of British actors, or at least actors who can do a passable British accent, which makes his overdone, over-enunciated and over-wrought dialect stand out almost painfully. It’s like when Madonna tried to pretend she was British for a while – she thought it made her sound sophisticated, while instead we looked at her with a mixture of bemusement and pity. Frewer does a lot of things well – he’s strange, quirky, and slightly pompous in a way that fits the character of Holmes. But it’s really, really hard to get over the goofy attempt at an accent. Kenneth Walsh does a better job as Watson. Although significantly older than Holmes, with that he has an air of competence and dignity that befits the character. What he lacks, however, is a sense of fun. Nigel Bruce may have been a little goofy, but he at least seemed to enjoy the role. Colin Blakely was excellent. Walsh is merely competent, and that’s pretty much the closest thing to an insult you can say without actually saying something negative about an actor. I actually like the attempt to do something new with Holmes here. Although Doyle wrote some 56 short stories and four novels starring Holmes, it seems there are just a few in usual rotation for adaptations (The Hound of the Baskervilles, The Sign of Four, and a sort of an amalgamation of the relatively few Moriarity stories). In truth, not all of them would work that well in film, and considering how many other writers have played with Holmes since Doyle’s passing, telling an all-new tale with the detective doesn’t bother me in the slightest. I even like the idea of having him try to investigate a supernatural mystery. The movie doesn’t go so far as to confirm the existence of vampires in this universe, and there is nothing out-of-context or anachronistic about having people afraid of such a creature. It’s a way to have a little fun with a familiar character, placing him in a different arena than he’s used to. The end of the movie goes for the classic “parlor room scene,” where Holmes explains just how he deduced the killer’s identity. It feels a bit clunky, though, a bit perfunctory. What’s more, it’s sort of irrelevant at that point. Even though Holmes knew it was Abel behind the mask of the killer at that point, it doesn’t really matter. It could have literally been anybody in the chapel that took the bait and then got caught when the tremor knocked over the statue… it’s a “whodunit” where the “who” is largely an afterthought, and that’s a weak story in any case. The other three Hallmark Holmes movies were all actually based on Doyle’s stories, including adaptations of Baskervilles and The Sign of Four, and it’s possible that those are structured better than this stab at doing something different. And since the DVD set I’ve got has all but one of those films on it, maybe I’ll even give the others a go some time. But not now, not until the memory of better Holmes fades and the urge to give Matt Frewer another chance rises again. As for now, I think I need to turn to a Holmes that does the story different, but does it better nevertheless. Plot: Once in every generation a Chosen One is born, a young woman with the power to stand against the tide of the greatest predator in the world, the vampire. Unfortunately, this generation’s slayer is a ditzy cheerleader named Buffy Summers. 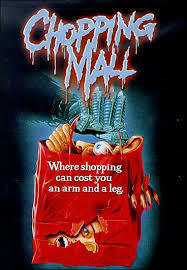 Buffy (Kristy Swanson) and her friends are hanging out at the mall one day when she’s startled by a creepy figure (Donald Sutherland). She tries to shrug it off, but begins having dreams of an earlier life where she battled a vampire named Lothos (Rutger Hauer). In the present day, Lothos sleeps, but his minion Amilyn (Paul Reubens) is ready to wake him up. A pair of burnouts, Pike (Luke Perry) and Benny (David Arquette) encounter the girls a few times before wandering off, drunk. Benny is taken by Amilyn, while Pike is saved by the strange man from the mall, Merrick. He approaches Buffy and asks her to accompany him to a graveyard so she can claim her “birthright.” She doesn’t believe his claim that she is the Chosen One, but when he begins describing her dreams to her, she agrees to accompany him. Two freshly dead people rise, transformed into vampires, and Buffy instinctively stakes them. Pike, home in bed, is approached by Benny, who hovers outside his window and cannot enter without an invitation. Benny cries that he’s hungry, brandishing a new pair of fangs, and Pike refuses him entry. Unnerved by the strange things he’s seen, Pike plans to leave town. Meanwhile Buffy, after some persuasion, begins the training she should have undergone years ago, taking to the night to slay the vampires. She winds up saving Pike, whose effort to escape town is thwarted when he’s jumped by Amilyn. Amilyn escapes, but loses an arm in the process, and is scolded by Lothos for his failure. At a basketball game, Buffy realizes one of her friends has been turned and pursues him through the streets of the city. Pike joins in the chase and the two, on motorcycles, hunt him to a storage yard for parade floats. Lothos and Merrick both intervene in the fight, and the vampire lord slays Buffy’s mentor. Buffy’s friends show no sympathy when she turns up depressed the next day, and she and Pike get in a fight in public over her unwillingness to continue the fight. Neither of them know Benny is nearby, hears the fight, and learns that Buffy is the Chosen One. With her name revealed, Amilyn and Lothos plan to destroy her. Pike crashes the senior dance, dancing with and kissing Buffy just before Lothos’s vampires break through the windows and attack the hundreds of assembled teens. Pike presents Buffy with a bag of stakes he prepared, and she goes on a slaying spree. Benny and Pike fight in the dance, Benny offering to change his buddy into a vampire, but Pike refuses and slays him. Buffy encounters Amilyn in a stairwell, staking him in front of Lothos, who is unmoved by his minion’s death (or melodramatic death scene). Their battle spreads back to the gym, and Buffy stakes Lothos in full view of the school. Together, Buffy and Pike ride his motorcycle into the sunrise, leaving the town to wonder what the hell just happened. Thoughts: Joss Whedon is, today, a god among geeks, creator of such cult favorites as Firefly and Dollhouse, director of the biggest superhero movie of all time in The Avengers, and pioneer of original online content with Doctor Horrible’s Sing-Along Blog. (Not to mention is more recent film Cabin in the Woods, a great entry into the horror canon, my analysis of which is available exclusively in the eBook edition of Reel to Reel: Mutants, Monsters and Madmen.) His star began to rise in earnest in 1997, when his Buffy the Vampire Slayer TV show became a hit for the fledgling CW network. That show largely ignored the film that birthed the character, though. 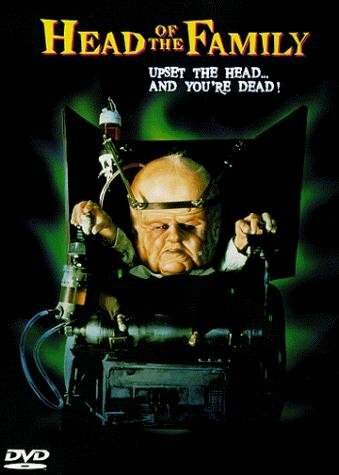 Released in 1992, Whedon was never happy with the way director Fran Rubel Kuzui treated his script, playing it as a much broader comedy than he intended. And in truth, anybody who watches more than a few minutes of the TV show will agree that the film pales in comparison. That said, though, looking back 20 years later, there is a bit of cheesy charm in this original version of the Slayer. 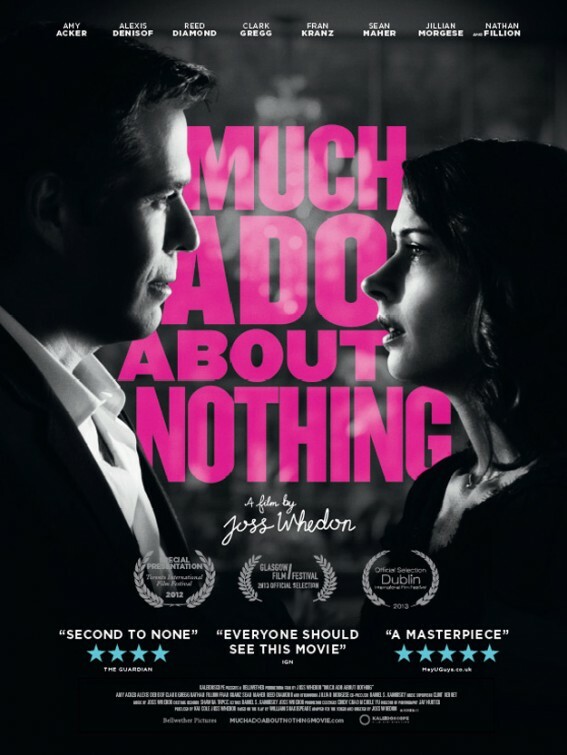 Whedon’s initial concept was to take the typical horror movie victim – the teenage girl – and turn her into the hero. It’s a great, simple idea, but the final film goes a bit too far in playing up the stereotypes. Buffy and her friends (including future Oscar winner Hilary Swank) are vapid to the point of obnoxiousness. That may well be the intent, but once they start jabbering about choosing “litter” as the theme for a socially-conscious school dance, you kinda want to see them all die. The only thing more irritating is the basketball coach shouting to his team to “actualize” as though it’s a defensive strategy. Pretty much all of the humor is too broad for the characters, in fact. The only really goofy moment that works is when you realize the vampires have, in fact, been invited to the dance and thus can enter. Of course they were invited. They’re seniors. Much of the violence and action isn’t quite believable either. An early scene where Buffy chops up a hot dog Benny is using to taunt her is supposed to be an early indicator that she’s got power, but instead just seems like the director used poor editing to cover a joke that had no punch. A few minutes later, when Merrick throws a knife at her and Buffy catches it, it’s even worse. The image is so stilted I’m inclined to believe Swanson was actually filmed throwing the knife away and Kuzui played it in reverse. For all its faults, there are some good moments in the film. Some of Buffy’s dreams are a bit silly, but others are played for straight horror. There’s a nice one, for example, where she’s going to bed and the viewer doesn’t quite realize she’s already asleep when she lies down, Lothos beside her. For a moment you think she’s just oblivious to her enemy (even though it’s already been made clear a vampire cannot enter a person’s home without an invitation), but when he gives her a teddy bear and she curls up on him it’s downright unnerving. You feel a little relief, moments later, when she wakes up. Placing one of the fight scenes in the parade float storage yard is another nice touch – the oversized figures and statuary make for a suitably eerie backdrop for a fight. It’s kind of sad this is the last thing Kuzui directed, she actually has an okay eye for horror that would have worked well in the darker-toned Buffy TV show (where she served as an executive producer). That less broad version of the character may not have been too bad in her hands. Buffy would later become a great character in the hands of Sarah Michelle Gellar, but the embryonic form still has a bit of steel in her. Swanson’s Buffy is never quite as vapid as her friends, and begins to grow rather quickly. She isn’t the girl power icon she would later become, though. I still keep going back and forth on an element of the character that was disposed of entirely when she transitioned to television – the use of menstrual cramps as an early warning that vampires are nearby. Somebody out there help me – is it empowering to use a nuisance that is unique to women as a weapon in the fight against evil, or is it patronizing to base Buffy’s Spider-Sense surrogate on a natural process that is so often played as a negative stereotype? I feel somehow that the answer to that question would go a long way towards explaining if it’s okay to like this movie or not, but having a Y chromosome (as I do), I don’t think I’m actually qualified to answer it. Paul Reubens is a really bizarre casting choice. At this point in his career he was already known primarily as Pee-Wee Herman, a role that he put away after an embarrassing public incident the year before. (Don’t pretend you don’t know what I’m talking about.) Doing Buffy felt like an effort to rejuvenate his career, and although it didn’t really succeed, it wasn’t for lack of trying. His Amilyn works well as a sort of Renfield, the second banana to the main vampire, with just enough of an edge to feel like a credible threat. The only time he gets silly or plays up his traits as a physical comedian is during his extremely protracted death scene. (That scene, by the way, isn’t a bad joke, but it’s a joke that goes on entirely too long.) He, at least, is memorable, though. Rutger Hauer’s Lothos… not so much. It’s not that he’s bad, he’s just dull compared to all of the other great vampire performances out there. It’s an early 90s film, but it actually carries with it a lot of the tropes of the 80s teen sports movie: the character who doesn’t want to play the game, a training montage in which she unlocks her natural talent, and a Big Game at the end for all the glory. There’s even the requisite clueless authority figure (a very funny turn by Stephen Root) who both hassles Buffy for the change in her behavior and tries to be her pal, sharing far too much information with her than anybody is really comfortable with. There’s also a fun little game of “spot the future celebrity” worth playing. Hilary Swank has a sizable role, but you can also catch Ben Affleck as an opposing basketball player, Thomas Jane as a punk teenager, and Ricki Lake and Seth Green (who would go on to have a regular role on the Buffy TV show) as vampires. For all the crap it gets, the movie isn’t really all that bad. It’s competently made, and none of the performances are horrible. The plot works, but the tone is off. This never would have made any credible “worst of all time” list, it would simply have been forgotten, one of hundreds of movies made every year that are completely off the cultural radar short months later. We remember it, though, if for no other reason than because it gave us one of the greatest horror heroines of all time.